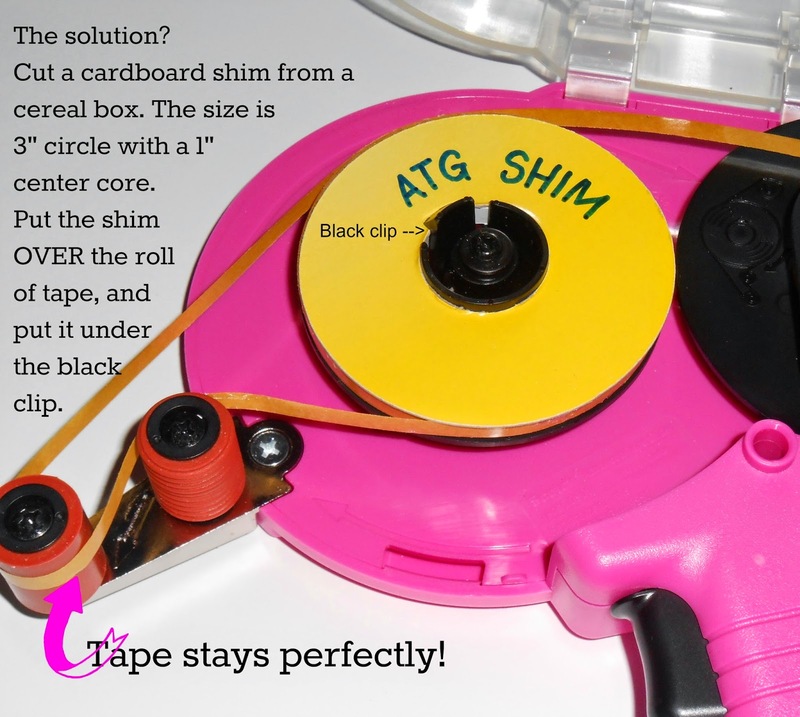 One of my very favorite tools in my craft room -- something I use every time I'm crafting -- is my "Adhesive Tape Gun" (ATG) by Scotch 3M. I use the pink one, where the refills are typically 1/4". From time to time, I sponsor a group "buy-in" of off-brand tape refills which seem to me to be just as great as the brand variety, though they are a lot less expensive. I buy them from Tape Jungle, where with a purchase of 144 rolls (12 dozen), the price is $1.16/roll, including shipping. 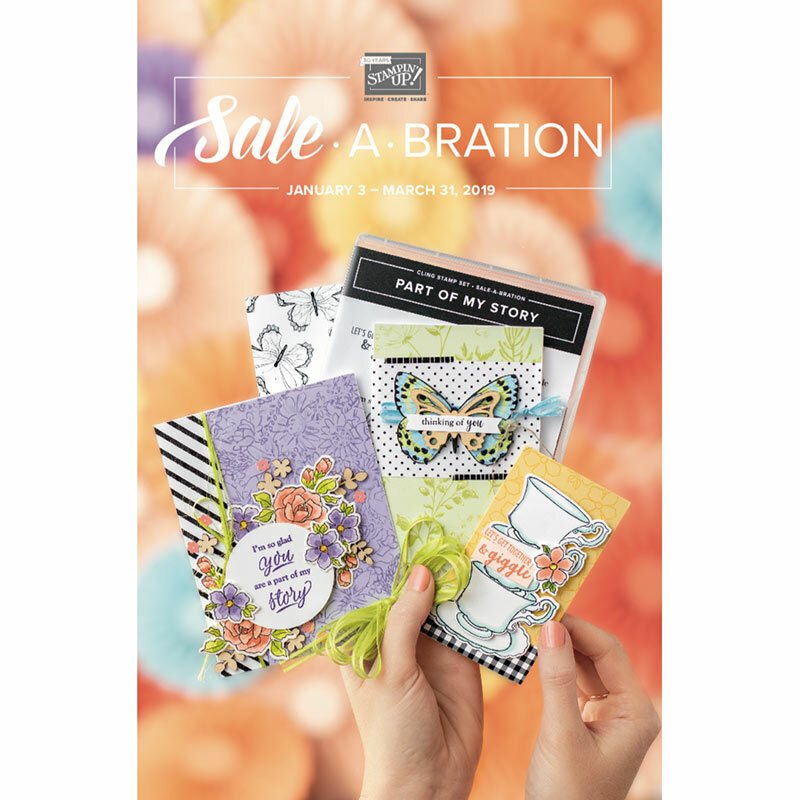 No matter if you buy off-brand or brand refills, many of my crafting friends say they've experienced the dreaded "tape slip". 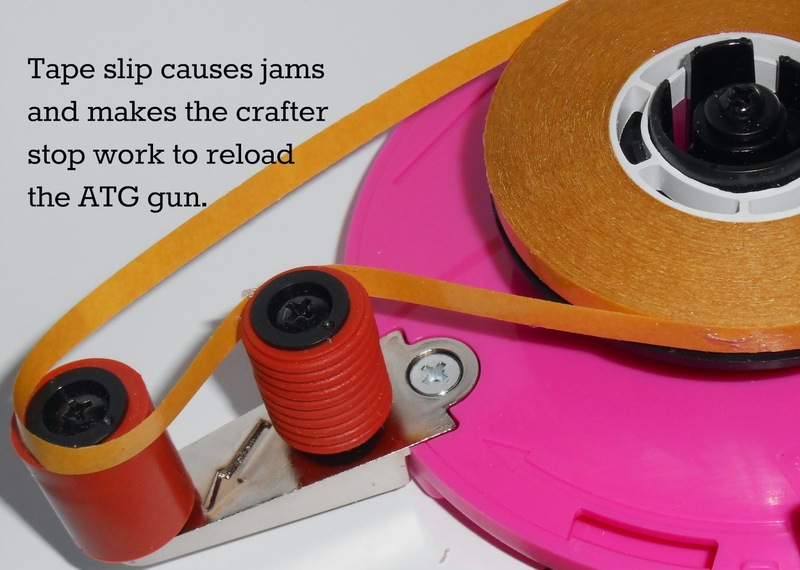 Even a perfectly-threaded refill will fall off the applicator roll in the front, causing the tape to jam and the need to rip, disconnect and rethread the tape. 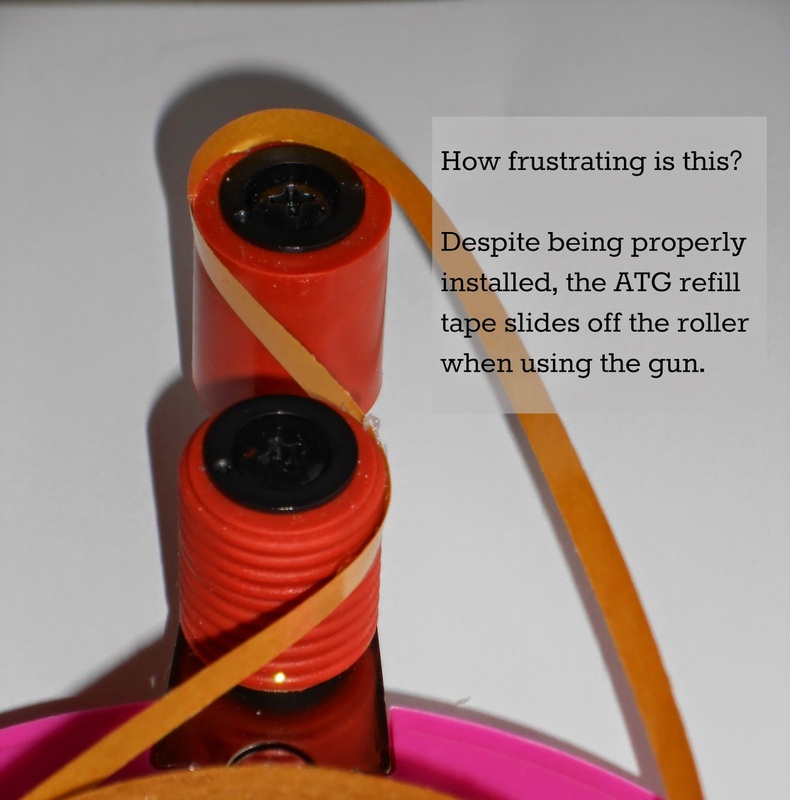 Just place the shim over the roll of refill tape that you've loaded into the ATG gun. Here's my offer to my readers: If you just don't feel like making one of these shims yourself, just leave a comment here, and send me an e-mail (to cardmonkey@comcast.net) with your address and I will mail one to you, free! Be in touch if I can help you with this crafty tip! By the way, do you prefer the Silhouette or the Cricut. I have both and I can't figure out the Explore yet! So I didn't leave my address on the first message!!! Silly me!!! What a great solution to such an annoying problem! I do not eat cereal so wondering what else you could use? I am guessing tha the slick finish on the cereal box keeps the tape from sticking to it. Love to get one from you. Kathy Dunn, 210 A Ellis Ave, Niceville, FL 32578. I was just complaining about this very problem to my scrapping friends!! I would love a shim, thank you for sharing your genius with us! Awesome! I would love one. I would love one!! I'll send an email with my address. Thank you for doing this. This is a brilliant idea!!! Thank you again for sharing! Finally! This is so awesome! Btw would love to know when you hold another group buy in! OMGosh what an amazing cure for our tape dispenser blues. I have 2 ATGs. I keep one filled with general purpose tape and one filled with photo safe tape so I am ready. I'm sending you my addy in an email. I'd love one! 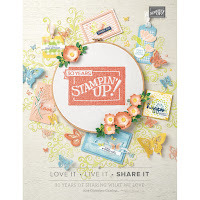 Be sure & include your return address so I can send a thank you! I posted a video a while ago with the same solution but yours is much prettier. Lol!! I would love one of these shims. My ATG got so tangled up, I don't even want to use it! I'd love one too! I'll send an email with my address. Thanks! How very sweet of you!! I will email my mailing address and thank you so much in advance!! That's awesome. Thanks so much..off to email you. totally brilliant! I just had a knee replacement so really don't know when I will get back to crafting but when I do this will be the first thing I make! TFS! I would like to get your ATG shim please thank you. (: I will email my address. Ty! The tape going off the edge of the roller has always bothered me. 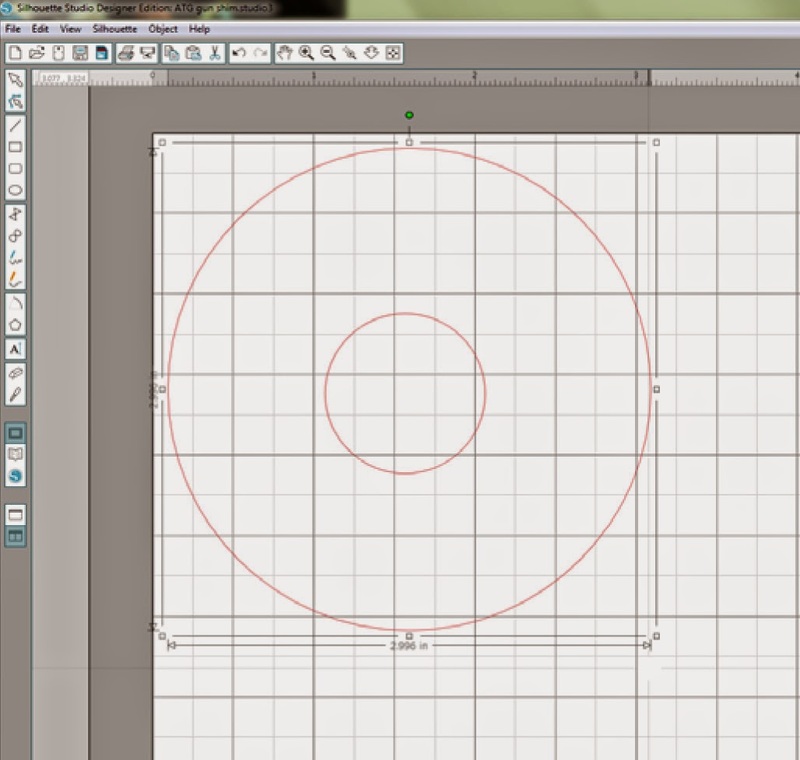 Made one of these "shims" tonight and it works perfectly. Thank you very much for letting everyone know about this fix. What a wonderful tip - just found it on Pinterest. This will eliminate a lot of frustration. Thank you! I'll send an email because I would love to have one. The Buckle Boutique sparkles in the New Year!